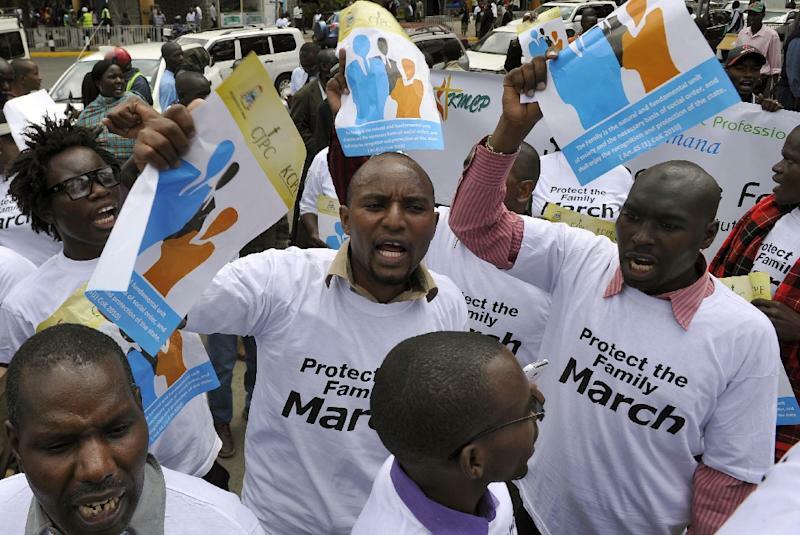 Nairobi (AFP) - Kenyan anti-gay protesters marched in Nairobi Monday warning US President Barack Obama not to speak about gay rights when he visits the country of his ancestors later this month. "We do not want Obama and Obama, we do not want Michelle and Michelle," they chanted. "We want Obama and Michelle and we want a child!" "It is important for us as Kenyans to know that the US is not God, and thus we cannot follow them blindly," said protest organiser and evangelical Christian pastor Bishop Mark Kariuki. Kariuki said Obama was welcome to visit "his father's home" but should not "talk about the gay issue." The demonstration drew around 100 people, wearing T-shirts and waving posters with the slogan "Protect The Family". It came a day after Kenya's Deputy President William Ruto, who is on trial at the International Criminal Court in The Hague accused of crimes against humanity, told worshippers at a church service that homosexuality was "against the plan" of God. "I want to say as a Christian leader that we will defend our country Kenya, we will stand for our faith and our country." Obama's visit later this month will be his fourth to Africa since becoming US president, but his first to Kenya since taking office in 2009. He will also travel to Ethiopia. 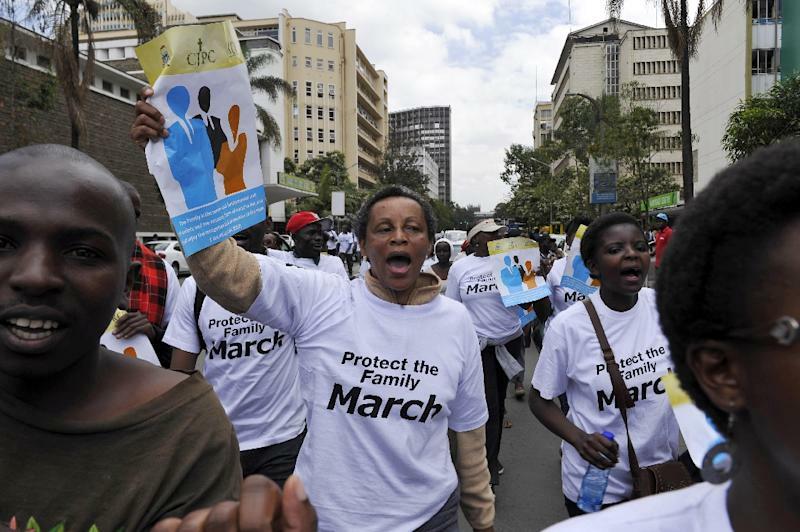 Pro-gay rights activists warned of rising intolerance in Kenya, including attacks on homosexuals and alleged cases of lesbians being raped to "cure" them. "The anti gay movement is spreading to Kenya... cases of discrimination and violence are increasing because of the very homophobic speeches," said lawyer Erik Gitari, from the National Gay and Lesbian Human Rights Commission. "Obama has been associated with equality and liberation, being the first black US president. They are afraid that he will preach equality here," said Gitari. Nigeria and Gambia have passed tough new anti-gay laws in recent years, with Gambia's President Yahya Jammeh, calling homosexuals "ungodly, Satanic... vermins [sic]" in a speech last year.